Margaret Tate, a very tyrannical boss of a New York publishing firm, has broken the jurisdiction of her U.S. visa and as a result must go back to Canada for one year before she can re-apply for a new visa. When the opportunity arises to lie and say that her executive assistant Andrew Paxton and her are engaged, she grabs the opportunity. Following through with the scheme however, becomes far more difficult than anticipated when the two go to visit Andrew's family in Alaska. "The Proposal" is nothing new in the romantic comedy department, however the delightful chemistry of Sandra Bullock and Ryan Reynolds is perfect, making the predictable story definately worth a watch. The film is quite hilarious and regardless of having an overly generic script, first time screenplay writer Pete Chiarelli, developed hysterical scene after scene that did nothing but entertain. The 107 minute film moves at a great pace, with funny situations or dialogue keeping both men and women entertained alike. Ryan Reynolds and Sandra Bullock really make "The Proposal" worth watching. I am not so sure that having two other actors in this film, would have worked as well as Bullock and Reynolds did together. From the very get go, Bullock and Reynolds have a complimenting chemistry that gives the film it's spark and it resonates all the way through to the finish. Ryan Reynolds, who plays Margaret's (Sandra Bullock) willing assistant Andrew, delivers some absolutely hysterical scenes once he realizes Margaret has to do as he says or she will be deported back to Canada. On the other hand, Sandra Bullock delivers a zany and side-splitting performance as the city girl who is now stuck in Alaska faking that she is engaged to be married to Andrew. The romantic chemistry between Reynolds and Bullock is also there and the two do share some moments that will get the women of the audience swooning. The supporting cast in "The Proposal" are very good and help to make the entire film enjoyable. The family of Andrew Paxton is well written and comically performed with Betty White playing his grandmother, Craig T. Nelson as the father and Mary Steenburgen as Andrew's mother. Betty White gives a stand out performance as Grandma Annie and really reminds us why we have all loved her for so many years. Seeing White dressed in Native American clothing doing a tribal dance around a fire was priceless and as the trailers have shown, almost every scene she is in, she has a laugh out loud joke. Craig T. Nelson does a good job of playing the distraught father and his scenes shared with Reynolds are good, although they do take a bit of the momentum away from the laughs throughout "The Proposal." Oscar Nuñez (The Office) also delivers a risible performance as Ramone, the local grocery store owner who is the only male stripper in the small Alaskian town. When the women decide to take Margaret to Ramone's adult entertainment show, the result is completely outlandish and one of the funnier moments in the film. Most of the fun in "The Proposal" is watching Bullock's character Margaret Tate, being taken out of her element. Tate is a control obsessed boss who must entrust her fate in the one person she has mistreated the most in her career, her assistant. Sandra Bullock shines as she realizes that she no longer has the upper hand and must surcome to the demands of her assistant Andrew or be deported. Reynolds, who is at his best in comedic roles, delivers a memorable performance in a film that seemed to be very forgetable. 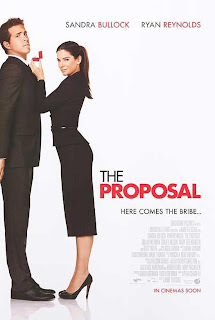 "The Proposal" despite being a storyline that has been done numerous times, found perfect chemistry in Bullock and Reynolds, delivered a fresh take on an otherwise over-used idea and most importantly created a memorable romantic comedy that could be enjoyed numerous times. Lastly, I would be surprised if Reynolds and Bullock did not work together again in the near future.